You have come to the right place if you are looking for fun, engaging and exciting Letter S activities to do with toddlers, preschoolers and kindergartners. Our activities are widely used by teachers, moms, dads, child care providers etc. for learning and teaching while being fun for the kids! This project incorporates a special “signature” from each child — their individual hand print shapes. Not only are the little hands in the craft cute, but using a special item that reflects each child’s personally fosters self-esteem and sparks a sense of ownership. They can see themselves clearly reflected in the craft. This large sunflower “reaches” to the sun and has real sunflower seeds on its face, an extra tactile dimension to the creation. STEP 1 Paint paper towel tube with green paint. Let the tube dry. STEP 2 Staple the eight hands around the lip of the paper plate. STEP 3 Place glue in the center of the plate and pour sunflower seeds on top. Discard the ones that did not stick… and eat them! It’s also fun to scatter different things for “seeds” into the center of the flower — buttons, sparkle beads, pebbles, dried beans, peanut shells. FINALE – Staple the painted tube to the back side of the paper plate. Glue the two leaves to the green “stem” of the flower. PROJECT CHALLENGES – The main challenge with this craft is the stapling part. When stapling the tube to the plate, you may wish to staple one end of the tube shut first and then staple the plate to the tube. A heavy duty stapler will work best for this, however, the handheld one will work with a few tries. Have the children scribble on a piece of paper with black crayon. Then have the children use other colors to color in the sections between the scribbled lines. They will be surprised at the colorful picture they end up with. For each child place a small drop of tempera paint in the center of a large piece of paper. Give each child a straw and have them blow (lightly) the paint around the paper to make a design. Take one of dad’s old/ugly ties- the busier the print the better. Cut open on of the ends, and fill 2/3’s all the way will fiber fill. Then, insert either a hanger you have made straight or a length of medium-light gauge wire. fill the rest of the way, and sew/glue/web-iron the tie closed again. The wire or hanger seems pretty important to giving the body some shape and letting you give it that “S” shape, but you could skip that part if you had to. Now, add googly eyes and the long tongue with the “V” shape at the end, and you have a rain forest anaconda! Young ones should be able to do most of the project! When making your snake leave the tag on the underside, the children put the snake around their neck and put their finger through the tag to make them move. This would be good for Earth Day. Recycle those paper towel rolls! Start at the end of the paper towel roll & cut in a circular or spiral line like the one that is already on it.When you get to the end cut out a head shape. Now cut the tail into a tapered shape .Now the snake can be put on your arm, it will wrap around. Let the kids paint. Directions: Have child decorate their “S” with stars. Directions: Place black construction paper in a box top. Dip marble into white paint. Place the marble in the box top and have child move the box top around to form the “web”. Have the child glue a spider onto the web. Children make snowmen faces for each plate, glue on hats. Hole punch at ‘ear’ place on each head. (Through the hole punched holes) Connect the heads with the ribbon, tied in pretty bows. The outer two ribbons should be left longer to tie to whatever to display your happy snowmen faces. With a clean white tube sock, insert a juice can lid, or any other metal lid (flat side down, so Snowman sits upright) stuff with a little fiber fill (Bottom of body), tie off with white thread/yarn/string, more fiber fill (Middle of body), tie, and still more fiber fill for ‘head’ & tie off. Stuff the top of the sock into a little black hat you’ve already purchased. Finish off by adding the button eyes, whatever for nose, mouth, buttons. Little fabric rectangle for scarf around the neck. 1) Let the child paint a picture using regular watercolors. 2) Allow the child to shake salt on his painting while it is still wet. 3) When the painting dries it will sparkle!! Make cloud pictures with white chalk or cotton on blue paper. Make strawberries for art. Cut 2 large strawberries from red tissue paper. Glue or staple around the edges, leaving the top opened. Stuff with shredded scraps of paper. Use green paper to make the leaves on top. Teach the children how to skip. Show them how to jump and kick on alternate feet or to step and hop on alternate feet. 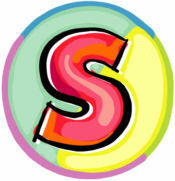 Use Sandpaper to cut out the letter S so the children can feel the shape. 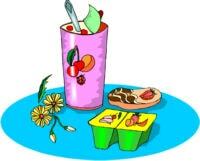 Have a graphing activity to graph favorite Sandwiches. Pretend to be Snakes and make the SSSSSS sound and slither on the carpet. Sing silly songs while playing on a seesaw or while skipping. Let everyone take a turn. Put different scents (strawberry, lemon, vanilla, peppermint extracts) on cotton balls and then put them in plastic containers with tops. Have children guess what they are. Make a big letter S on the carpet using masking tape. Have class take off their shoes and slide on the letter S in their socks. Tell the children a day before to think of their favorite sport and why so they can talk about it at class the next day. Have the children wear something to school that day that is from their favorite sport or sport team). When they come in, form a circle and have each child tell about their favorite sport. You can elaborate on the topic by joining in and telling the class various sports facts. That day for snacks have bite sized hot dogs, popcorn and pop to drink. Prior to class, hide various shapes around the room. When you begin your lesson show the children the various shapes they are to find. Give each child a copy of the shape they are to find, and a clue. Then set them loose to find their shape. As a reward, have snacks of peanut butter and jelly sandwiches that are cut out from various different shaped cookie cutters. Draw a tree in all four seasons. Make silhouettes of each child. This makes a nice gift for a holiday. Place an object on a piece of colored construction paper and place it in the sun for several hours. The paper will fade around the object. Leaves work really well. 1. Pour half of the apple juice into a saucepan. Heat until boiling. Remove from heat. Add flavored gelatin and stir. Pour remaining apple juice into mixing bowl. Sprinkle it with unflavored gelatin. 2. Stir gelatin and juice in mixing bowl. Add to hot juice, add ice cubes. Stir until ice cubes melt. Refrigerate about 10-15 minutes. Put half of the apple gelatin into each plastic bag. Close and seal. 3. Cover a baking sheet with foil. Cut about 1/4 inch off one corner of the bag. Hold the bag over the baking sheet, slowly squeezing the bag to form snake shapes. Repeat with remaining mixture. Chill for 2 hours. Spread cool whip dessert topping onto a graham type cracker. Add gummy bears or bear shaped cookies. ENJOY!!! This activity provide a great sensory experience as well as fine motor control for the assembly. I removed it tooooooo late! So he put his head down between his knees! “Oh my, a windstorm just passed by! The swans fly away, but I don’t know where. I saw a little creature that was slimy, smooth, and wet. I thought it was the oddest thing that I had ever met. It was something like a lizard, but it had no scales at all. It was something like a frog, but it didn’t hop- it crawled.